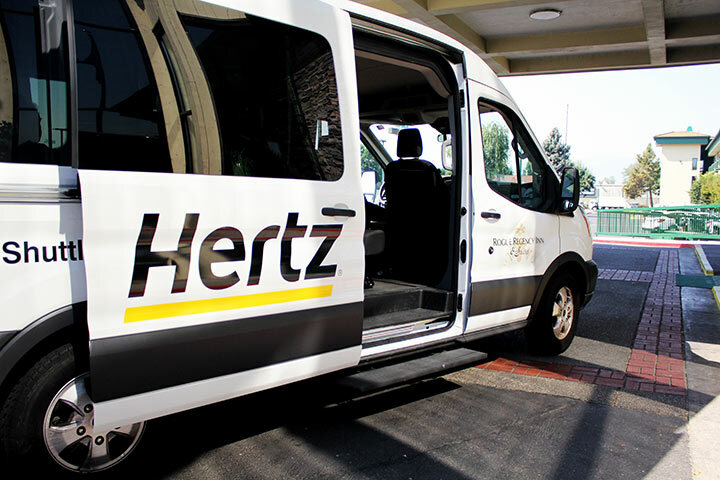 Hertz Car Rental is now located inside the Rogue Regency Inn & Suites. Hertz Car Rental free shuttle will pick you up from the airport and bring you to our hotel. Enjoy the convenience of your car and room in the same location. The Hertz Car/Sedan collection features your classic compact and full-size sedan rental cars. We offer renters a variety of cars suitable for any budget. When you rent a compact/economy car with Hertz Car Rental, you can expect anything from a Nissan Versa, Toyota Corolla, Chevrolet Impala or a similar vehicle. This is your go-to collection for everyday budget friendly, quality car rentals. Whether you’re trying to road trip on a budget or traveling for work, our compact/economy car rentals will get you to where you need to be. Make a reservation and pick-up your economy car rental at Rogue Regency Inn & Suites today. With car rentals for your business or vacation, Hertz Car Rental has a wide range of luxury, sports, and hybrid rental cars to meet every need. Save time with thousands of convenient car rental pick-up and drop-off locations all over the world. Take advantage of our credit card-free reservation policy to make renting a car, van or truck with Hertz a breeze. You’ll love our great rates, too. In fact, you’ve got our best car rental rate – guaranteed. Enhance your vacation with Hertz NeverLost® navigation and let SiriusXM® Satellite Radio be the soundtrack to your roadtrip. Got kids in the car? Add on our TravelTab® for an instant Wi-Fi hotspot for them and international calling for you, or reserve a rental car seat to keep everyone safe on your travels. And don’t forget to sign up for our free Hertz Gold Plus Rewards for even more savings with points that never expire. Rent a vehicle with Hertz today!